Exposure to high levels of noise is one the most significant stress factors of our day and age. It is not without reason that loss of hearing is the most highly registered occupational illness within the EU.Trotec BS15 noise level measuring Yet excessive noise is not only restricted to the workplace – it is also the No.1 stress factor in the home and outside the house during leisure time. 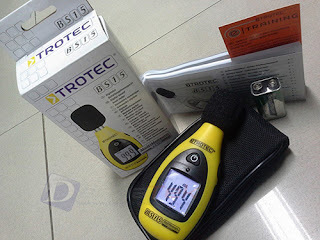 Trotec BS15 noise level measuring There is a number of ordinances and laws in place governing permissible noise levels in residential areas or at the workplace, but these are often ineffective because of the lack of suitable devices to measure the actual noise levels and assess the risk to health. The BS15 is a robust and precise measuring instrument that can be used both indoors and out. It possesses a whole host of features which you would otherwise only expect to find in a much higher priced sound level meter. The BS15 can determine the noise emission source reliably within a range of 40 to 130 dB( A) . Values either side of this scale can be displayed as a maximum or minimum value. There is also an attachable wind protection cover for field work included in the scope of delivery designed to suppress the sound of the wind and other interfering noises which could otherwise affect the quality of the sound level measurements. An integrated sensor constantly monitors the ambient light and automatically switches the display illumination on in the case of poor lighting conditions. This means that quick and efficient readings are possible in every situation and easily readable on the large LCD display. The unique combination of innovative equipment components, ergonomic design and an unbeatable price/ performance ratio makes this precision instrument ideal for a multitude of applications, for example, sound and noise level measurements in offices, during free-time activities, when checking machines, in the home, on construction sites, in discos and much, much more. Trotec BS15 can also be used to perform quality checks in the building trade, for example, to detect noise emission sources or inadequate noise isolation. Such noise disturbances are often conveyed via ventilation systems or utility shafts.